Your partner was unfaithful and now you are trying to get past all the hurt it’s causing you. You may be experiencing a number of different emotions including embarrassment, shame, guilt, anger, and sadness. You are probably going through a roller-coaster of feelings; loving and hating your spouse, all at the same time. Maybe you are wondering if this incredible pain will ever go away and end. Research shows it takes about eighteen months to two years to heal from the pain of your partner’s infidelity. Knowing that the pain isn’t going away overnight can be helpful, and knowing that it will eventually end is also valuable in the healing process. It will take time to decide if you want to continue in the relationship. Once you come to your decision, you can then move forward in the process of your healing and growth. Also it’s important to note that just because the healing process can take up to two years doesn’t mean you will be in pain and distress every day for two years. There are no right or wrong ways to get through this pain but there are several things you can do to help you move through the hurt, pain, and stress. Ground yourself when you are feeling the emotional roller-coaster revving up. Stop and take three deep breaths; in through your nose and out through your mouth. Check-in with your senses; ask yourself what you hear, see, smell, and feel. Sometimes you just need that moment to catch your breath and your thoughts will slow down so you can get a handle on your array of feelings. When we keep our emotions bottled up, we tend to have those sonic boom moments and eventually explode. Therefore, don’t ignore your thoughts and feelings. Write them down on paper or digitally. Talk about them with a trusted friend, family member, and/or therapist. Just address your thoughts openly and honestly to someone who will listen without judgment. Allow yourself the time to grieve the loss of fidelity. Elisabeth Kübler-Ross’s Five Stages of Grief are Denial, Anger, Bargaining, Depression, and Acceptance. You may experience many of the stages all at once. You will ultimately get to acceptance that this happened, which is conducive to moving past the agony and misery. Eat, Sleep, and Exercise. Keeping physically healthy actually helps your mental state of mind. Eating healthfully, getting a good night’s sleep and exercising all make you feel better. Exercise can be relaxing and help calm those painful thoughts. Spend time doing things you enjoy. Take up a new hobby or get back into one you haven’t done in a while. Pamper yourself, take a class and learn something new, or read something entertaining. Whatever you choose to do, enjoy your “you time”. 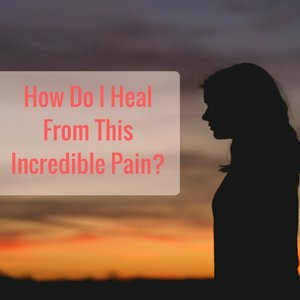 Understanding the how and why is important in being able to move on and heal. This is something a with which a Marriage and Family Therapist can help, either in individual or couples counseling. Get your questions answered and then stop asking them so you can move forward and feel less frustrated. Be patient with yourself. Healing takes time, but know that you will move past the pain. Forgive the affair, whether you stay with your partner or not. Forgiveness promotes the healing you need and desire. Believe and know you will heal.